It's official. I've become one of those nutty cat women. 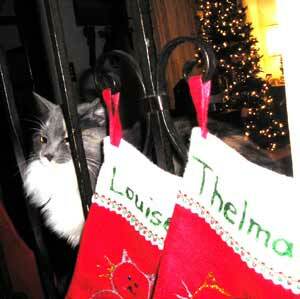 I realized it as I was hanging up the Christmas stockings for my two 8-month-old kittens, Thelma and Louise. The stockings that I bought to match mine and then decorated with glitter paint. The stockings that are already filled with cat toys which will be played with for a short time on Christmas morning before being secreted in the toes of my shoes or tucked somewhere in my bed. This is their first Christmas so they have been fascinated with and a little baffled by the decorations. Every item has to be inspected from all angles, checked for durability (i.e. knocked onto the floor), and thoroughly tasted. Most of my decorations are too large for them to cart off in their teeth but I've been a bit concerned about the figures from the Nativity scene. I have visions of climbing into bed and finding that the Holy Family has taken up residence under my pillow via kitty transport. As you might imagine, I was also worried about what they would do when I put up the tree. The prickly branches, the dangling sparkly ornaments and the twinkling lights would surely be too much for them to resist. I love a Christmas tree though, so I was determined to have one. I just needed to minimize the potential for damage. 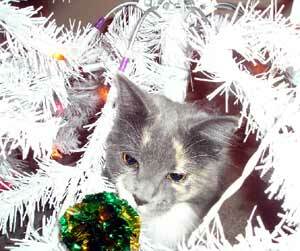 I've had cats at Christmastime in the past and know that there are some basic rules to follow. 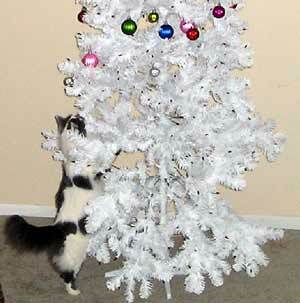 Like no tinsel - unless you want to be pulling it from your cat's behind at some later date (been there, done that). And glass ornaments probably aren't a good idea either. But I have a house with a lovely floor to ceiling bay window, just itching for a proper tree. A shopping trip was in order. I was all set to go for the green, when I was captivated by a vision in white. White needles, white lights, white stand, it was gorgeous, and it was going to look fantastic in my living room window. I checked the price - less than $30! If the kittens destroyed it by climbing to the top in King Kong fashion, then I wouldn't be too terribly upset. I teetered a box containing the inexpensive, ready-to-assemble, pre-lit tree off the shelf and into my cart. I also selected several dozen plastic ornaments: icicles, snowflakes and sparkling orbs - all in gold. I already had an angel to top the tree. A red and gold tree skirt completed my shopping list and I was on my way home with visions of a white Christmas (tree) dancing in my head. Imagine my surprise when I opened the box and found that my tree was covered in multicolored lights - not white! I had gotten the wrong tree! Gold ornaments were not going to look good on that! Ever the optimist I decided to assemble the tree anyway - who knows, maybe I'd like it better with colored lights. I stacked the three pieces, connected the lights and then plugged it in. Yuck! This tree just wasn't going to work for me in my traditional style living room, although I'm sure it would look lovely in Willy Wonka's chocolate factory covered in big, bright candies. Even the kittens were more interested in the box than the tree. I was going to have to take it back. I went to the kitchen to grab a cup of coffee before I disassembled the tree. That's when a car drove through the front of my house - or at least that's what it sounded like - and the two kittens went streaking past me and down into the basement. I cautiously peaked around the corner into the living room. There was no SUV in evidence, but somehow the Christmas tree had been flattened and looked sort of like an umbrella turned inside out. How could two little balls of fur do that kind of damage? I guess I wouldn't be returning that tree after all. So now what was I going to do with a mangled tree with multicolored lights that still didn't look good in my living room? I managed to re-bend the branches back to their original configuration, but what to do about the lights? That's when inspiration hit. I could just replace all the colored bulbs with white and then the gold ornaments would look good and I'd have the tree I wanted. OK, that sounded like a simple enough plan, but there were things about which I was unaware. For example, did you know that you can't just buy a bunch of replacement lights? Oh no. You have to buy them in packs of 6 for a dollar, and good luck finding white. I had 450 lights to swap out. Divide that by six and then multiply by a dollar. Ack! My new plan needed a new plan. A friend suggested I buy strings of lights instead and then use the bulbs from them. Genius! I could buy strands of 100 lights for less than two dollars. I was going to make this work after all. It was only after I plucked the first blue light off of the tree and the first white light off of the newly purchased strand that I noticed a teensy little difference. All the lights on my tree came from white cords with white sockets. All the white lights were on green cords with green sockets. Rats! This was still doable, but would be a little more work. I needed to free the bulbs completely from their plastic housing and replace the bulbs only. This involved unbending the copper wires, slipping the bulbs out of the green plastic, straightening the wires, feeding them back into the white plastic, bending the wires into place and then replacing it in the socket. 450 times. I had done about 7 of these when I decided I should probably do a test before I went any further. What if they didn't work? 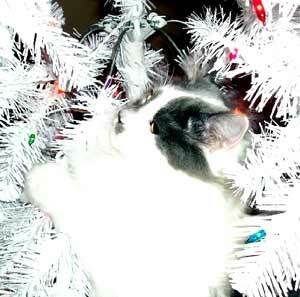 I plugged in the tree; the lights lit up in glorious white and then "Pfffzzzt!" and darkness. Did I just fry the tree? Sigh! There was only one way to find out. I re-replaced the white lights with the original color lights, unbending and re-bending the copper wires, and putting the color bulbs back in their respective sockets, I crossed my fingers and tried again. The tree lit up in its original splendor and that's when I gave up trying to change it. The white tree with multicolored lights had won. I moved it to a corner of the family room - where it didn't look half bad, actually - and headed back to the store. Having learned my lesson, this time I bought a green tree with white lights. It looks lovely with the gold ornaments. I also bought some multicolored ornaments for the white tree. I think it could look lovely too, but the kittens have claimed the tree their own and keep climbing up and removing the decorations. I don't know where they are putting them. 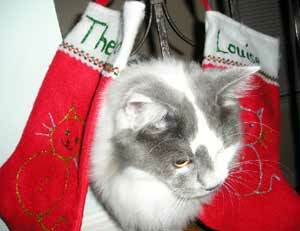 Maybe they are planning to string them up around the litter boxes for a more festive potty area. Who am I to judge? After all, I have the snowman shower curtain, towels, and soap pump decorating mine. In true nutty cat woman fashion, I had wanted to have a "family" portrait taken for my Christmas cards this year, but just couldn't get a photo where both kittens were looking at the camera at the same time. We'll try again next year, and maybe even attempt a trip to visit Santa. But for this year, the trees are up - such as they are, the decorations hung, and we are ready to enjoy and celebrate the holiday season.